Accentuate gate entrances with a solid 6×6 post made of granite or limestone, or for a dramatic effect, place a stone post between every section. Each post has 2 flat sides making fence attachment a breeze. Custom artwork or your homes property address can be incorporated for an additional fee. 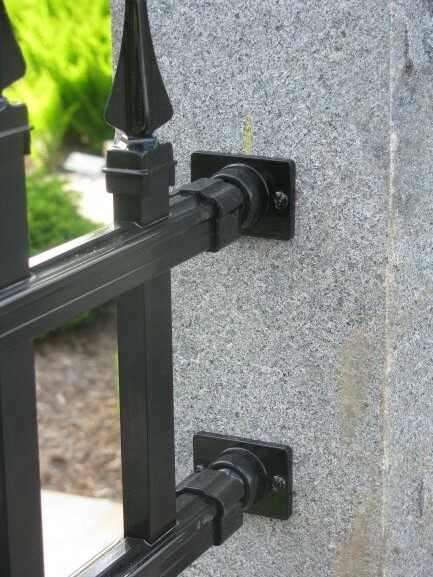 Black granite posts look sharp with white, black or light grey fencing while brown limestone posts work well with tan, almond and brown fences. Stone posts can be used with aluminum or vinyl fences. Imported. 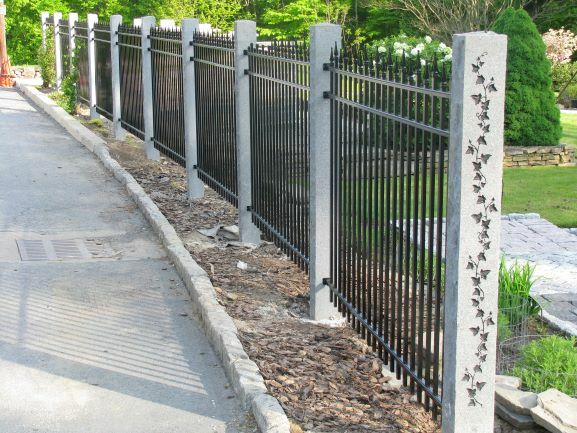 Pictured are Rolling Rock’s Black Granite posts with custom etched ivy design and Radiance’s RAST-110 3-Rail aluminum fence with staggered spears in black. Spears are topped with decorative Quad finials. Find a link to both Rolling Rock and Radiance on our Fence Vendors page.